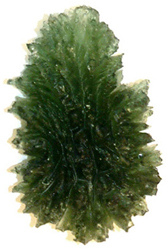 Moldavite is the only crystal sold by Sound Travels, because of it's unique transformational and connection enhancing qualities. Formed by a meteorite colliding with Earth many millions of years ago, this green glass-like crystal is found in limited quantities on the bed of the River Moldau in the Czech Republic. Among the healing properties of Moldavite are it's ability to enhance cosmic connections and communication with interdimensional beings, to aid in the transformation and cleansing of self. This crystal possesses an intensely high vibrational energy which activates the entire chakra system, stimulating the kundalini and at the same time serves as an excellent energetic protector, dispelling heavy energies which invade the auric field. Sound Travels stocks Moldavite in many forms: as jewellery - beautifully set silver pendants and earrings, and as individual Moldavite pieces of varying sizes for display or healing use. Whichever form you are drawn to, this crystal will serve as an effective partner in bringing the rapid transformation along one's path to greater higher awareness and manifestation!